Suicide Bunny e-liquids are 70% VG / 30% PG and are made in The USA. 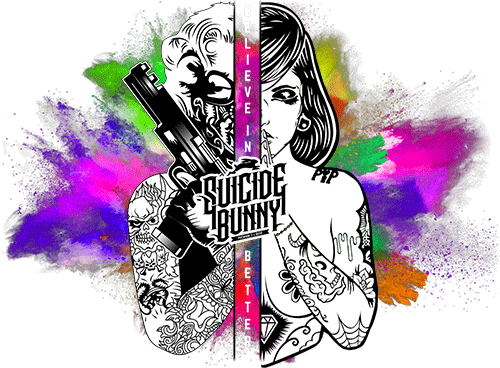 Suicide Bunny e-liquids are available as 50ml of zero nicotine e-liquid supplied in a 60ml shortfill bottle, can be used with an optional 10ml nicotine shot. The highly popular Suicide Bunny e-liquids are made with premium ingredients 'by vapers for vapers'. Derailed: a fresh baked cookie wrapped in a sweet cinnamon banana exhale. The smell alone will have you craving more. Madrina: an enchanting cream base, with notes of melon tucked into every layer. Mothers Milk: This juice is a complex blend of flavors. It has been described as a creamy custard with a sweet strawberry exhale. Mother’s Milk is an excellent all day vape and the signature juice from Suicide Bunny. Mothers Milk and Cookies: Cookies with a creamy custard with a sweet strawberry exhale. Queen Cake: This amazing vape has layers of delicious cake, rich creams, subtle hints of glazed pineapple, all topped with a drizzle of sweet icing. Queen Cake truly delivers the rich, full flavour that Suicide Bunny has always been known for. Sucker Punch: alluring dragon fruit mix, laced with a silky-smooth cream. The OB: a rich and creamy blend. There's so many layers, you're bound to experience something different every time. Wanderlust: With a desire to create the best dessert vape around, Suicide Bunny researched desserts from around the world. What they discovered was that no matter where their travels took them, there was always cake. This vape layers sweet, vanilla cake with delightful, rich icing. Stingy Jack: Ripe, tart apples wrapped in luscious, sweet caramel. Sure to leave you feeling voracious enough to carry on the legend of Stingy Jack. Bunny Season: a beautifully layered vape of sweet key limes wrapped in rich creams and crisp graham crackers.